The past week has taken us very far. 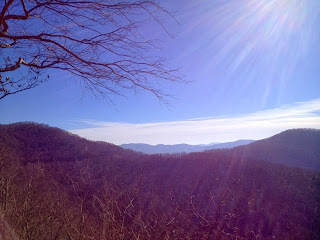 We celebrated Christmas in Asheville, NC: the Blue Ridge Mountains. 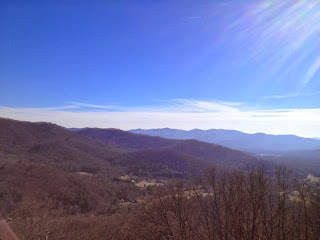 Before we left town we drove along the Blue Ridge Parkway on Mount Mitchell and then turned onto the Elk Mountain Scenic Highway. The top of Elk Mountain offers fabulous views and it's often snowing up there when the rest of Asheville is dry. 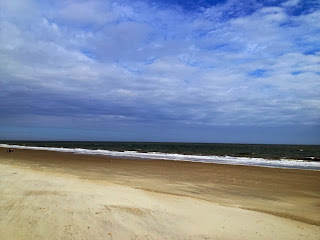 We stopped at home for a night, re-packed the suitcases, and headed for the beach. 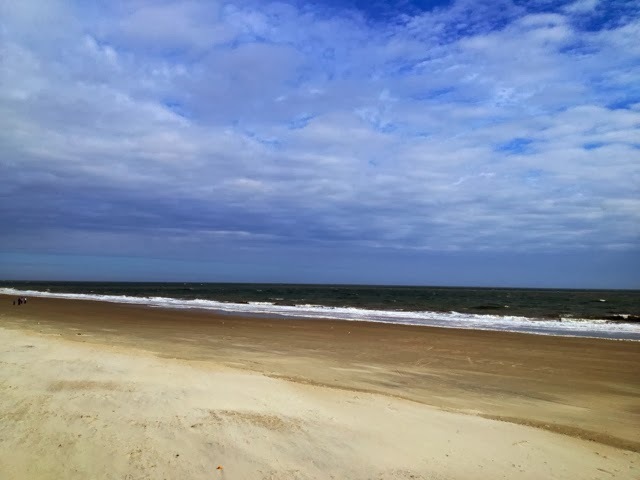 We arrived at Tybee Island, outside Savannah, Georgia, two days ago. The trip was utterly horrible. It should have taken five hours but lasted nearly eight instead. Now that we are finally here we love it. This morning the tide was out and the children were able to walk far out off the shore. 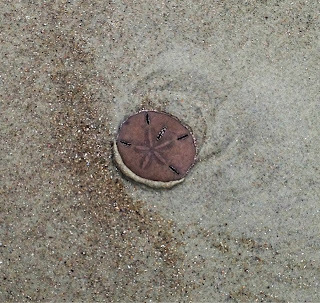 We found live sand dollars, hermit crabs, and various shells with the animal still inside. We let them go, of course, after the kids examined them. It reminded me of my own childhood. 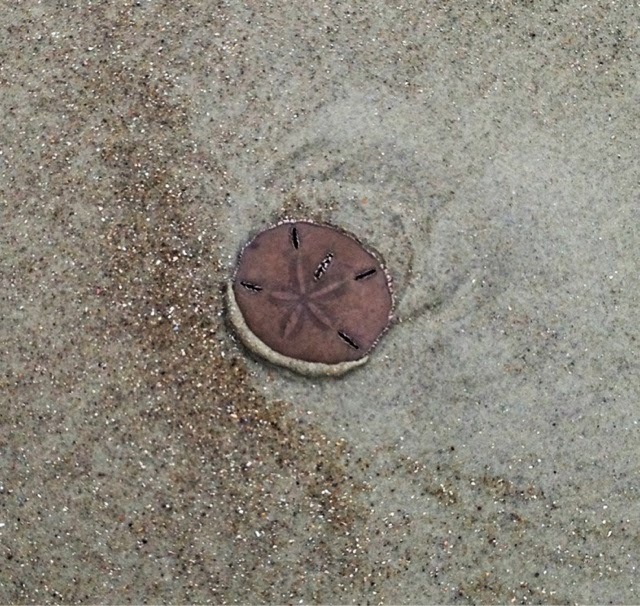 I spent countless happy hours playing in the California tide pools while my dad was out diving. We found plenty of unoccupied shells to collect. I'll have to decide what to make from these. Keep watching for those projects. Tomorrow we head home and then back to Asheville again for our annual New Year's Eve Wii tournament with my sister's family. 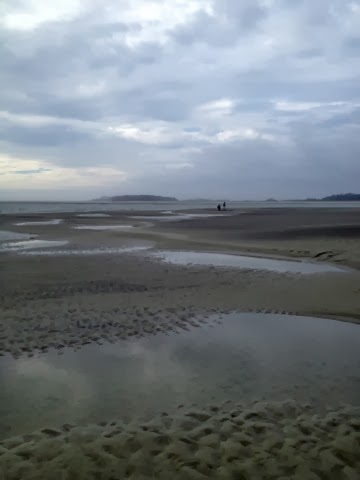 I hope you enjoy my cell phone travel photography. May the new year bring all you've been wanting. I hope your own holiday travels are safe and fulfilling. Well, here's what Christmas looks like around here, at least much of the time. 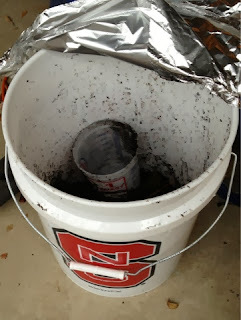 That is a giant bucket of worms. Last night was perfect worm weather: well above 70 degrees and raining lightly. When I went out for my walk the sidewalks were covered with huge night crawlers, some almost a foot long. I went back and recruited some help and we gathered worms for an hour or so. This morning our teen and his friends went fishing without success and tonight we took the younger kids out after supper, but still didn't catch anything. So I guess I'll set the worms free in the garden. I'm in a pretty un-Christmasy mood. I already wrote this blog once today but while I was trying to add a new photo our worthless computer (a Sony Vaio: don't ever buy it. Ours has been a lemon since day one) erased the entire thing so I'm re-writing it. Plus, although many of my friends are rejoicing, 70 degree weather for Christmas does not delight me. I miss Ohio. I get so homesick this time of year. Just as summer always means Michigan to me, Christmas always means Ohio, and it's never right when I'm not there. I miss my grandparents and my aunts and uncles and cousins and our holiday customs. Other than one Christmas spent visiting my European boyfriend, I never celebrated Christmas anywhere else until I was in my mid-30s. 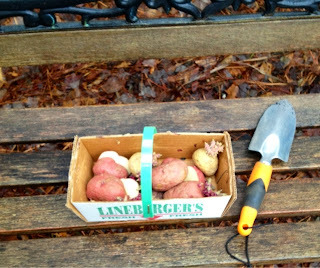 I did take advantage of the North Carolina weather to set out some potato starts I've been growing. We have kale doing very well in the winter garden, along with cabbage, cauliflower, onions, garlic, and lettuce. I hope the potatoes don't rot. The soil is so saturated from three days of constant rain, when I dug down more than four inches water spurted out of the ground! I've spent the day trying to make myself feel better, pinning pictures of Amish Country on my Pinterest board. I grew up on the edge of Ohio, near Berne, Indiana, the Amish town whose buildings still display signs in a dialect of German so old it's disappeared from Germany, and whose stores still have hitching posts for horses outside. We had an Amish maid named Katherina who used to come clean for us a few days a week and who also babysat for us at her parents' farm sometimes. It was fascinating to visit Katherina and her parents and 14 siblings and watch how they did everything without electricity. I've also been trying to make the house smell like Christmas. 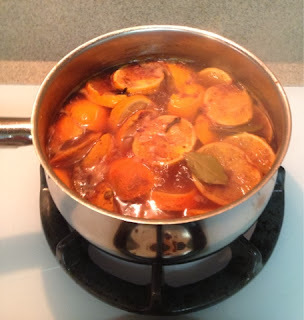 I made a stovetop simmering potpourri and I've had it going all day. Mix 6 sliced clementines, a couple teaspoons of cinnamon or a few cinnamon sticks, a whole nutmeg, some bay leaves, a teaspoon or two of cloves, and a teaspoon of ginger with 4 cups of water. Bring to a boil and then simmer as long as you want. When you're finished the whole mix can go in the compost. The house really does smell divine. We're just about ready for Christmas here. My parents went up to help my sister so she decided to host Christmas after all. I'm glad, because that's less pressure on me, so I don't have to prepare for guests. On Friday Jerry and I stayed up wrapping presents until 1 AM. Then we got up yesterday and went to the fire house to organize and label presents for Toys for Tots. Today everyone helped pitch in to get the house cleaned, and we've been baking cookies all afternoon for ourselves and to give as gifts to the neighbors and our family. All I have left are a couple more presents to wrap, the dusting, and the laundry and packing for our trip. 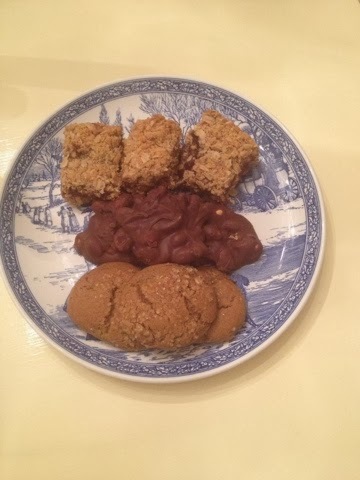 For the cookie assortments I am giving the Peanut Chocolate Clusters I shared in my last post, Pillsbury's Fruit and Oatmeal Bars, and Molasses Crinkles. The Fruit and Oatmeal Bars are basically jam thumbprint cookies in bar form; so much easier to make! You press half the dough into the pan, top with fruit preserves in your favorite flavor (I like raspberry), and top with the rest of the dough. 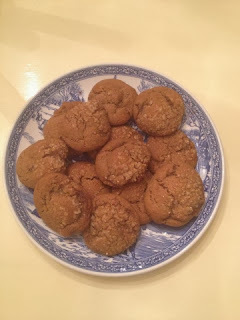 The Molasses Crinkles are a family tradition for me. My mom's Betty Crocker cookbook from the 1960s had the recipe and we always made them at Christmas. I've never see the recipe in another edition of the Betty Crocker cookbook, only my mom's. Imagine gingerbread cookies, but thick and puffy, with gooey, chewy centers and a crispy melted-sugar crust. I know your mouth is watering, but don't worry; I'll give you the recipe! For years I couldn't make these cookies. The original recipe calls for shortening, which we now know is terrible for your health. I tried substituting butter but the texture was all wrong. Finally, I discovered coconut oil. This non-hydrogenated vegetable oil provides the texture imparted by shortening without any trans fats and grants anti-inflammatory and metabolism-boosting power to your baking. What's not to love? I prefer VitaCost's Extra Virgin Coconut Oil, but in a pinch you can find Louana Coconut Oil in most supermarket baking aisles with the shortening. Mix coconut oil, brown sugar, molasses, and egg in a mixing bowl until smooth. Add remaining ingredients except dipping sugar and beat until a smooth, thick, clay-like dough forms. Cover and refrigerate 2 hours. Roll into 1 to 2 inch balls. Dip in water and then in dipping sugar. Place sugar side up on baking sheet and bake at 375 degrees for 8 minutes until cookies are set. If you are using white sugar it will melt and form a crackly glaze over the top of each cookie. Makes about 3 dozen. I used raw sugar for dipping because I replaced all our white sugar with coconut sugar, as it's supposed to cause less impact to your blood sugar and is harvested in a more sustainable manner. I also love the caramel flavor. The raw sugar doesn't melt into a white glaze like the white sugar, but it does make a very pretty crystalline decorative topping and it adds great crunch. I will probably pick some white sugar up tomorrow though, because I already need to go to the store. I noticed we are out of white flour for our traditional Christmas Eve rømmegrøt. 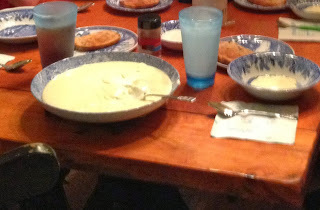 Rømmegrøt, which translates as "cream porridge", is the Norwegian Christmas Eve supper, just as lutefisk is the Christmas Day meal. It is pronounced "remma greht. Some people spell it with two ts at the end, but others use just one. If I put my phone in Norwegian it autocorrects to "grøt", so that is how I'm spelling it for this post, but my grandfather's original recipe has it as "rømmegrøtt". I don't know why these foods came to be the standard Christmas meals. It may have had something to do with the fact that, by the end of December, staples like milk or cream and flour and preserved fish were all that was left to eat in Norway! Through our family rømmegrøt tales I learned of long-ago ancestors and came to know cousins I've never even met. My grandmother never liked rømmegrøt because she grew up on a "cherry/dairy" farm and her mother could always use cream, which Grandma felt was too rich. Grandpa, on the other hand, grew up very poor. His father came from Norway at only 17, speaking no English and having no money, to be a sailor on the Great Lakes. He worked his way up to First Mate of his ship (just a step away from Captain) when he was stricken by polio and paralyzed. He became a shoe salesman after that, a, job he could do from his wheelchair, but it didn't pay enough and he struggled to feed his eight children. His wife, my great-grandmother, couldn't afford cream so she made her rømmegrøt with skim milk. Grandpa used to tell a story of his brother, Frederick, who died at age 13. Grandpa was trying to memorize his lines for the Christmas play at school. He was supposed to say "And now there is an S between" while wearing a letter S on his shirt to help spell out Merry Christmas. When he was practicing, though, Frederick kept saying, "And now there is some grøt between" and messing Grandpa up! I think in the end it went okay, and I'm so happy to know Frederick a bit, even though he died so long ago. In a 3-quart, heavy saucepan, melt butter. Whisk in flour, stirring until smooth. Add whipping cream and bring to a boil over medium heat, whisking constantly, until mixture is thickened and bubbly. You are basically making a giant roux. Blend in sugar and salt. Serve immediately or place in a covered bowl in a warm place until ready to serve. To serve, top each portion with melted butter, cinnamon, and sugar. Super healthy, as you can see! It's a good thing we only eat this once a year! I fill my gravy boat with melted butter and pass that around the table, as well as a shaker of cinnamon and a sugar bowl so everyone can top their own porridge. If we are going to the early Christmas Eve church service I often serve this as a light meal before, with snacks after if people are hungry. If we are going to the late service I fill this meal out with fruit and Norwegian Christmas Bread if I have any. I hope you might add this to your family's traditions if you wish. Now that I have to work so hard to make a happy Christmas for my children, I appreciate the memories my parents and grandparents made for me even more. I do get homesick and I miss the loved ones who are absent from me. I keep reminding myself, the people and places we love are always with us. Even if we can't see them in person we can conjure them in our minds and hearts, especially when we honor their traditions. I wish you a beautiful holiday full of your most cherished rituals and a new year in which you achieve every goal you've set for yourself. Enough people have arrived here at my blog by searching for tips to repair sticky plastic dolls and toys, I decided a lot of kids must be getting vintage holiday presents this year. That's totally understandable; my own kids are getting some vintage gifts. My five-year-old, especially, has gotten into watching the Ghostbusters movies on DVD, so I got him a bunch of the old 1980s toys. In many cases, when your child loves an older movie or cartoon, they want the toys to act it out and those are no longer available. My daughter loves the Little Mermaid II movie, so I've searched high and low for an affordable copy on DVD (we just have a VHS tape) and a Melody doll, to no avail. The Melody doll sells for around $200, even used, and during the holidays the price shoots up to $600 or more. Luckily, I know how to make mermaid dolls! Ghostbusters action figures, not so much. 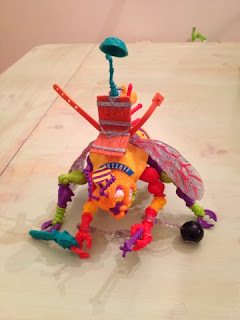 I want one of those new 3D printers so I can design my own plastic toys and just print them out! 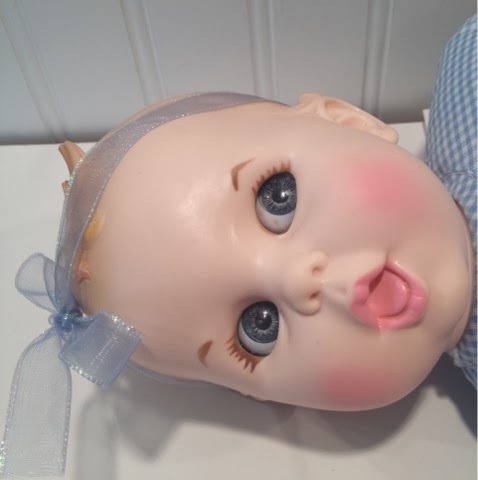 At any rate, if you're giving a vintage doll or toy as a gift you want it to be as new looking as possible. 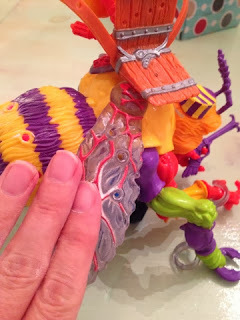 Often, even though the toy might be in good repair, the old plastic has gotten sticky. 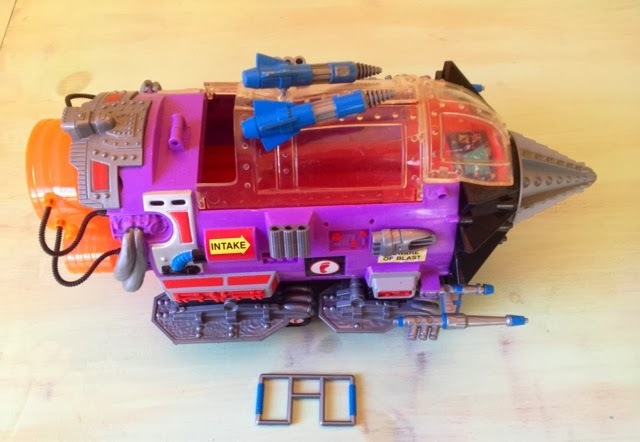 This is a really easy fix, so I will show you how, step-by-step, as I restore a Teenage Mutant Ninja Turtles Mega Mutant Killer Bee from the early 1990s. Apply baby powder to the clean, dry plastic. First, clean the toy thoroughly and let it dry. I use dish soap and water or Clorox wipes for this. You can also buy special doll cleaners if you want. Just be very careful around painted features like eyebrows and lips or eyes. Some cleaners will remove the paint! When your toy is clean and dry, sprinkle a little baby powder on your hands or directly on the toy or doll. Work in one small area at a time for less mess. Rub the powder in gently. Rub the baby powder into the plastic with your fingers, gently. The powder can abrade fragile paint and remove or scratch it, so don't press too hard. After a while the plastic will be saturated; you won't be able to get any more powder to absorb and it will sit on the surface. Wipe away the excess powder with tissues. Take a clean, dry white facial tissue (not a lotion-infused or colored one) and rub the excess powder away, again working gently. Sometimes excess powder will not remove this way and you will have to use a damp paper towel to remove it, but try to keep as much as possible on the plastic without leaving a white haze. The treated plastic toy, all finished. My Christmas chore list seems to expand every time I think about it. Christmas is wonderful when you have children, but it sure is more work when you're the mom! Yesterday I had to make something for the marching band bake sale. 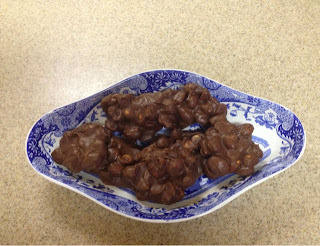 I'd been thinking cookies, but my friend Tammy suggested chocolate peanut clusters candy, which she made over the weekend. She said her family couldn't stop eating it. There are many versions of this on Pinterest, and I pinned a couple to my recipes board, but since Tammy used to own the town bakery and is famous around here for her culinary skills I used her recipe and I will give it to you. Pour peanuts into slow cooker and stir to mix. Layer peanut butter chips, then milk chocolate chips, then semi-sweet chips, then white chocolate bark. Cook on slow without stirring until chocolates melt, about 3 hours. Stir to combine. Drop by spoonfuls onto waxed paper and let harden or drop into mini-muffin tins lined with mini-cupcake liners in the pattern of your choice. The white chocolate needs to be almond bark or candy melts, because regular white chips don't melt well. As you can see, this recipe is super-easy, easier than cookies, I think. My biggest problem was finding room for all the sheets of drops to sit out and harden. I don't have enough mini-muffin pans to use for this. Tammy did hers that way, but then she used to own a bakery, so she has a lot of pans! I wrapped the ones for the band in clear treat bags and secured them with silver ties. However, if you are like me and prefer less sweet desserts, then you might enjoy different chocolates I make fairly often. Substitute the peanuts in the recipe above for almonds. Then sub all the chocolate for the darkest chocolate you prefer. After the chocolate melts, stir in one cup dried cherries (or more if you love cherries like I do!) and add a pinch of sea salt, cinnamon, ginger, and nutmeg to taste and continue the recipe as written. This is a super-healthy, savory variation. I concocted that recipe after I read a similar recipe in Shape magazine the same day I tried a Gingerbread chocolate bar from World Market. I was instantly hooked on the spiced chocolate. I made those and took them to my in-laws' house for Christmas and everyone HATED them so we had a ton left over! So, I should have taken the sweeter peanut clusters over there, but I far prefer the almond and dark chocolate. I only gave the band half the peanut clusters because I am working on Christmas treats. 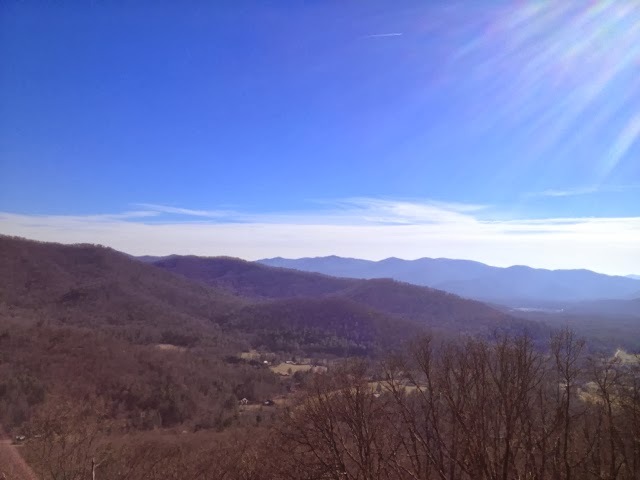 We were supposed to go to my sister's house in Asheville for Christmas and I was really looking forward to it because I love the mountains and especially Asheville. 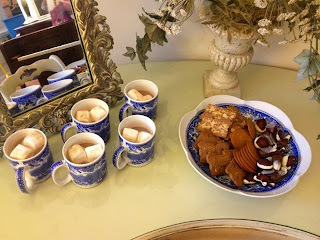 I planned to make an assortment of cookies and candy, like my famous truffles (check my God Jul post for that recipe: http://mandalineartfulliving.blogspot.com/2012/12/god-jul.html) to take up there. Yesterday, however, they had a water leak through two floors of their house, so now it looks like it's not going to happen. It's such a bummer, and worse, that means I will probably be hosting again this year. If so, I need to go ahead and get all the fun food done ahead so I can clean and prepare the Christmas dinner closer to the day. All the work on my store and decorating the house means it's really messy around here and I haven't wrapped even one gift or mailed the Christmas cards! I guess I'll get it together by Christmas; at least I hope so! I can't believe Christmas is almost here! Where has the year gone? With marching band and being sick for so long, I am way behind in my preparations. Usually I'm all finished shopping before Thanksgiving and get the whole house decorated before December. This year, not so much! It's unfortunate, because this house offers the perfect canvas for decoration. 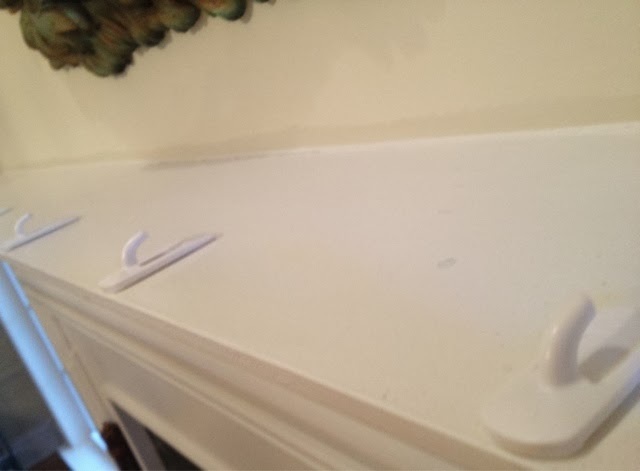 We have a fireplace mantle here for the first time in more than a decade. We have lots of breezeways and balconies inside the house, perfect for garlands and ornaments. Our foyer has a large window in the upper story, just right to display a second tree. We did manage to buy a small potted cypress for that window and we got the tree up and lights on the front porch. Everything else is still sitting around in boxes, though, so I'm getting an earful from the kids. First, gather your fresh greenery. Yesterday afternoon I went out into the yard in search of greenery for a garland. Our very first home had cedar and juniper and holly growing in the yard and I used to make gorgeous garlands for the mantle there. Some years we still have roses blooming in December so I would often add those to the garland for a bit of color. 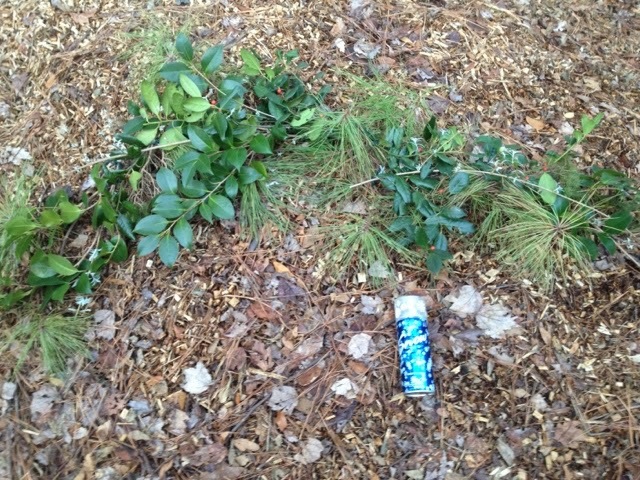 Here, I found camellia, buddleia (butterfly bush), cultivated and wild holly, and pine boughs. Before I could even bring them inside however, I had a fit of uncontrollable sneezing and my hands became swollen and itchy and were covered in hives. This turned out to be the effect of the wild holly branches, so those went right out into the yard again. I guess we know which trees we'll take down next! Before you start, place Command hooks so they have time to set up. 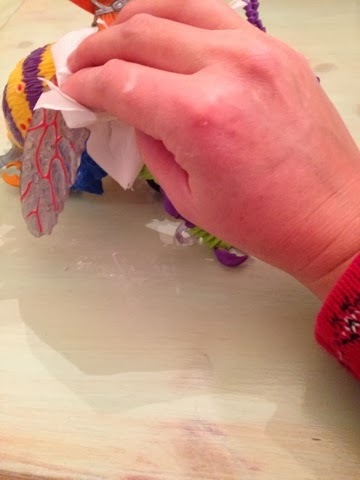 Once the allergens were removed, I set to creating a garland. 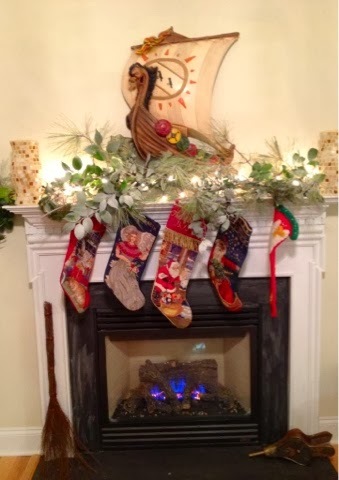 First, I applied Command hooks to the mantle to help hold the garland and the stockings. These have to sit for an hour before you use them, so I put them on to set up while I made the garland. 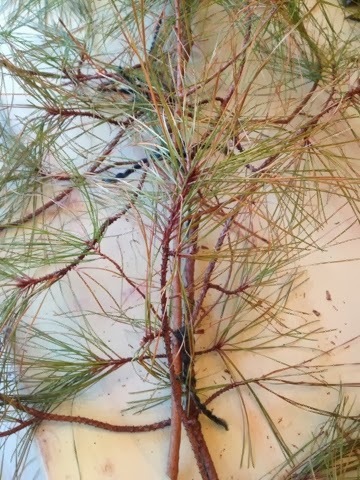 Use the largest boughs as a base and tie them to your long strand of yarn. Next, I planned out the size of my garland. For this I cut a strand of thick yarn the length of the mantle plus a bit more to hang over the sides. I had green wool and acrylic blend yarn left over from a sweater I knitted for my son. Normally, I prefer to use all natural fiber yarn for this, because it will decompose and the entire garland can be composted after the holiday, but this is the only green yarn I had. Once you've determined the length, decide which boughs will form the base of your garland. I chose sturdy pine boughs for the base. Lay the base boughs over the yarn you cut to length and tie them to one another and to the strand of yarn so you have a strong sweep of plant material to build upon. 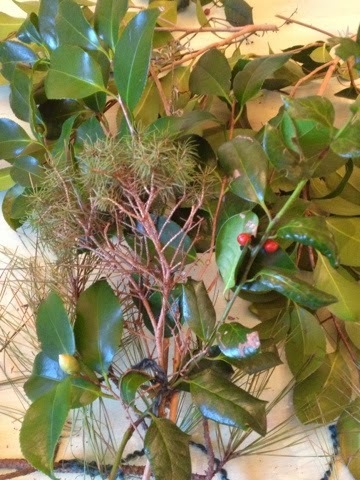 Arrange the remaining greenery into fan-shaped bundles and tie. 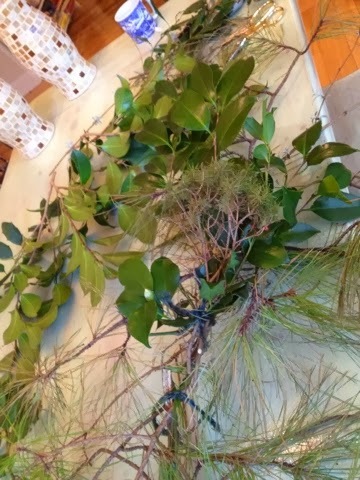 Next, gather bunches of your other materials and arrange them longest to shortest, so you have a fan-shaped bunch of greenery with the longest branches in the back and the shortest in front. My bundles are buddleia, which I think is perfect for Christmas décor because the leaves look like little silver stars, with camellia in front of that and holly with berries in front of that. 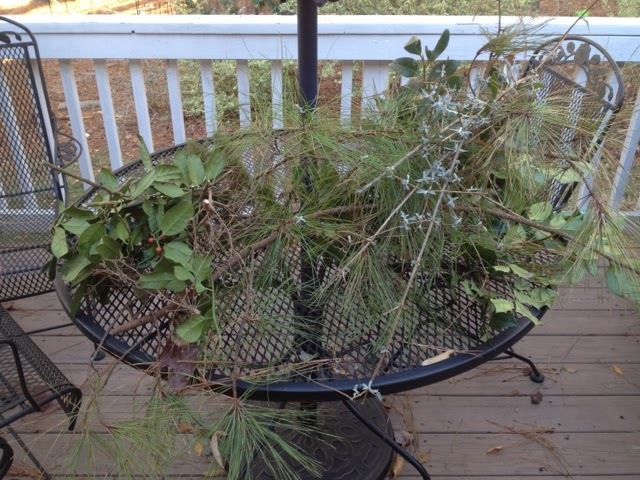 Tie your bundle together at the base and fan the branches out to shape it. Then tie the bundle to the base. Repeat this, layering bundles so the bases of the bundles face the center of the garland. This means you will be laying them in opposite directions with the tied ends facing the center point. Shape and tie the last bundle into a half circle and tie it over the center to hide the stems of the bundles. When the garland is finished as you'd like, trim any long yarn tied ends so they don't show. Tie bundles atop base, starting from opposite ends with tied bases facing the center. 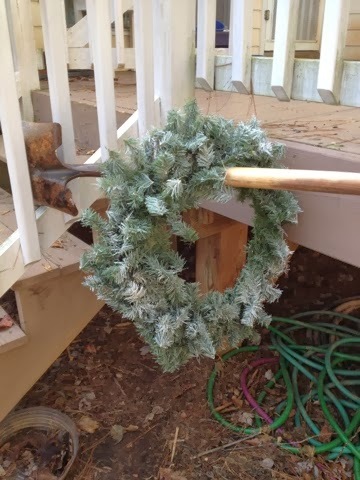 When your garland is all tied sturdily enough to be moved, take it outside or into the garage to spray it with "snow". You can purchase this flocking spray at WalMart or art supply and craft stores. It is very useful in decorating for winter and lasts a long time. It will clean off windows and things, as well, so you can use it for a wide range of decorations. 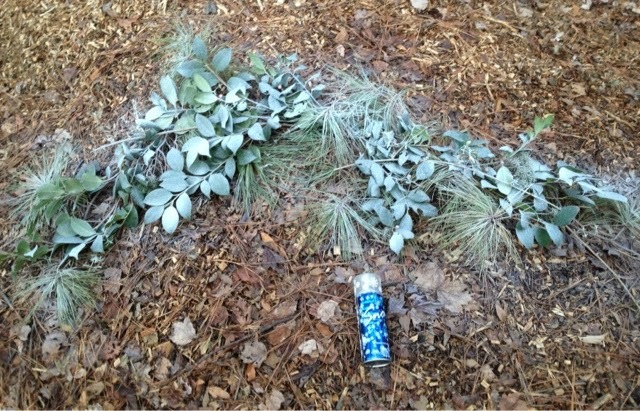 I like to spray it on greenery, artificial trees and wreaths, and grapevine or bare branches. 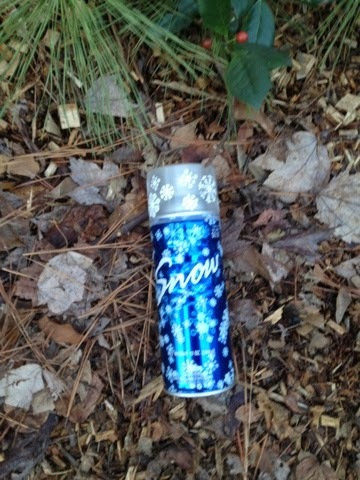 Hold the can 10-12 inches away and spray the snow like spray paint. Don't get the flocking too heavy because it won't dry properly. Just give everything a light dusting. 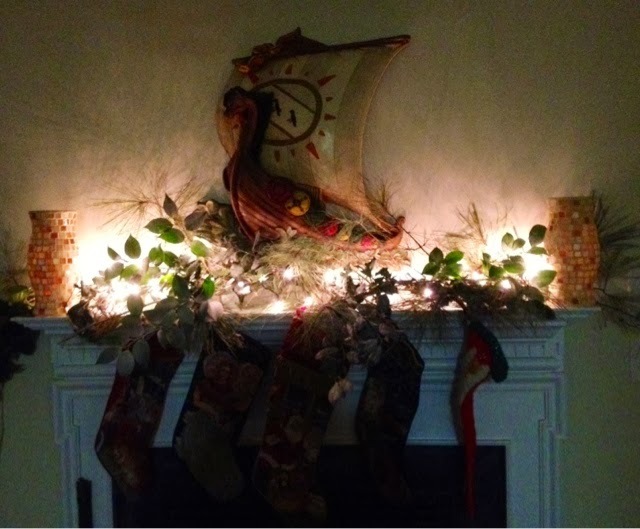 I let the garland dry for about an hour and then brought it in and put it on the mantle. 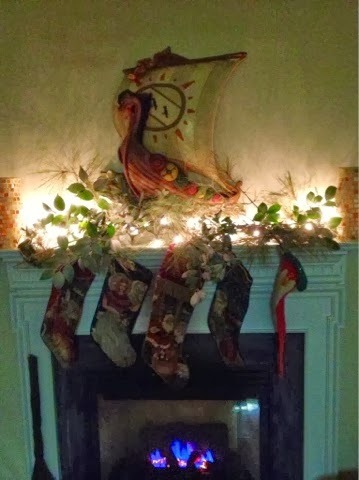 After the garland was up we hung the stockings. I wanted to put white lights in the garland and I know we have some around here somewhere, but I can't find them, so Jerry ran out for a strand. I think the lights make all the difference! I was considering putting gold and silver ornaments and jeweled fruits in with the greenery but once the lights were on I decided the garland didn't need that. I was considering making a tiny Santa hat for the Viking ship, but I found a little wreath so I used that. Merry Viking Christmas! Arrange the garland as you'd like. Add accessories such as lights and stockings. The finished garland, all lit up. 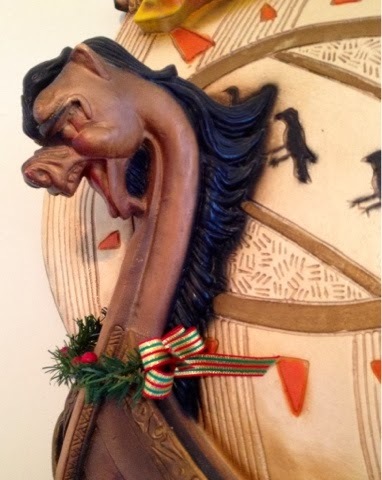 The Viking ship hung in my grandparents' house all my life and I have very early memories of my grandfather lifting me up so I could touch the shields. They bought the ship in "Little Norway" in Michigan back in the 1950s or 60s. Luckily, all their children think it's hideous, so I was allowed to take it after my grandparents died. Right now, if you can get to the Grand Traverse Lighthouse Museum in Northport, MI for Christmas, you can share a little of our family history. My great-great-great grandfather, a Danish-American and former lighthouse Keeper, is being honored with Danish flag decorations on the Christmas tree in the Museum. Although my Scandinavian blood is mostly Norwegian, I have some other influences. I was initially thinking of doing the mantle all in white and gold and silver, maybe with a little turquoise, ice colors. It would look fabulous in this house. 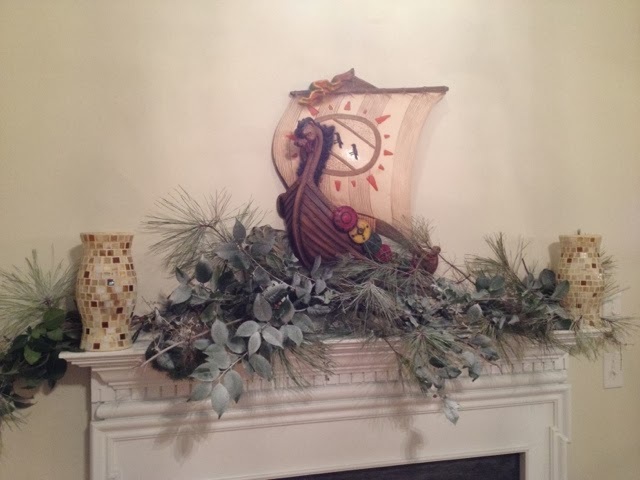 I thought I might replace the Viking ship with a snow-flocked silvery grapevine wreath. The stockings are such bright colors, however, I decided it wouldn't look right. 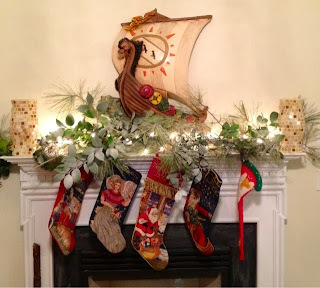 After all, we must put the stockings up! I still have my own childhood stocking, knitted for me by my aunt when I was a baby. So, I left the ship and let go of my wintry white décor ideas for now. Maybe when the kids are grown and gone and take their stockings to their own houses. Last year I saw one of our neighbors, who always has amazing outdoor seasonal décor, tied a pair of ice skates to her garage light fixture with a big ribbon. This brought to mind my old ice skates. 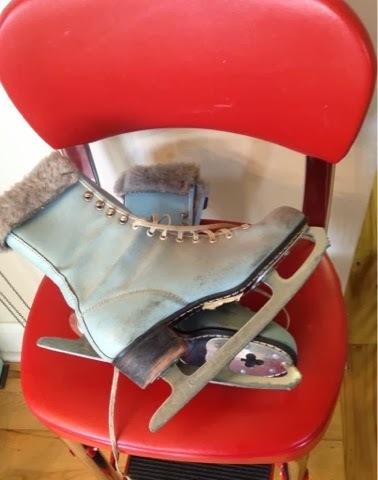 When I was eight or nine my mom and I found the most beautiful skates I've ever seen at a yard sale. They are pale blue Canadian Flyer leather skates with a silver leather insert running down the tongue. The tops are trimmed with gray faux fur and the laces are white with silver shimmery threads woven through them. The skates were too large for me but Mom went ahead and bought them for me to grow into. That winter, the skates were still a bit big, but wearable, but the lake didn't freeze. The next winter it still didn't freeze, or the winter after that. Because our hometown was situated on the lake and had its own public skating pond there were no ice skating rinks there. We moved away to North Carolina and finally had a skating rink, so I was thrilled I was going to be able to wear my skates at last...and I put them on only to find I'd outgrown them! That same year the lake froze hard in Ohio and I could have gone skating while we were home for Christmas if only I had some skates! It was such a great disappointment. I never could bring myself to sell the skates, even though they're still barely worn after all this time, because I love them so much. I was thrilled to have an idea to use them. 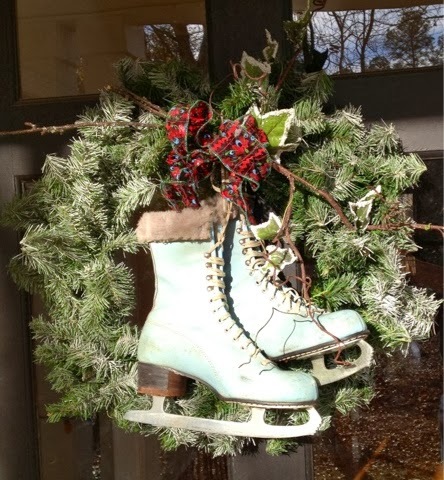 I decided to make a wreath for the front door trimmed with the skates. I forgot to pick them up while we were home at Thanksgiving, so Jerry drove all the way back and got them for me. I had an artificial wreath from our old house and I decided to use that because the skates are heavy and I don't think a fresh handmade wreath would hold them. Besides, I'd like to use this one every year. I simply sprayed the flocking snow on the wreath just as I did the garland. Jerry had the idea to hang it on the shovel to dry. When the wreath was dry I tied the skates on with their laces. Then I stuck icy-looking ivy and sticks under the laces. I covered the knots with a Scandinavian-print wire ribbon bow. I love the way it looks! It's very classic but not specific to Christmas so I can leave it up all winter. If I want to I can stick fresh greenery under the laces some years. So, now we're done with the exterior decorating and most of the interior. I just have the village and nativity to set up and everything will be finished so we can relax and enjoy the season. 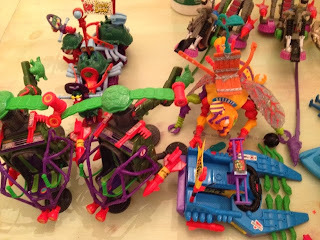 Besides all the decorating, I've been busy cleaning and listing a bunch of boys' toys from the 1980-early 90s. I bought two large boxes of toys to get some Ghostbusters items for our 5-year-old's Christmas present. He's really into the Ghostbusters right now! Besides the Ghostbusters, the boxes contained a ton of RoboCop, Teenage Mutant Ninja Turtles, He-Man, and Beetlejuice stuff, most of it complete and in excellent condition. My boys don't know about those, so I decided to sell the extras. It's been a funny trip down memory lane. In high school I babysat for a little boy who had almost all this stuff! 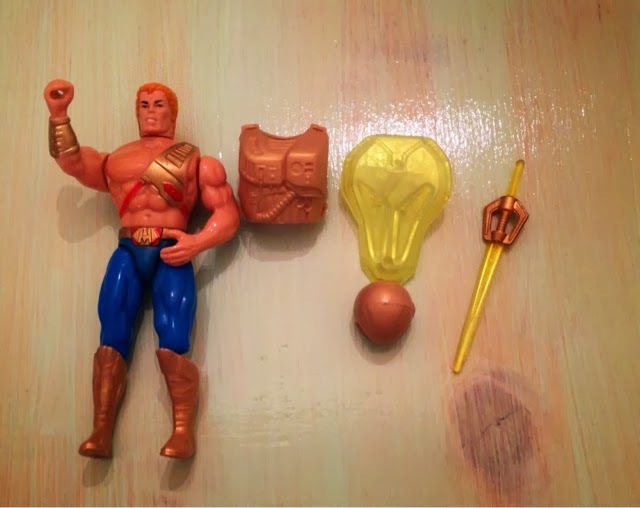 Check my store for all these retro boy toys: http://stores.ebay.com/atelier-mandaline. This time of year I always love to restore at least one baby doll. I guess since I always got a doll at Christmastime and I always give my daughter one it seems like the proper thing. 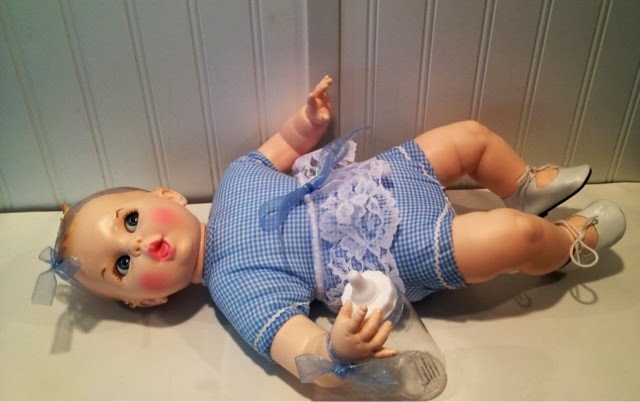 My daughter has moved beyond baby dolls now and is losing interest in all dolls, so I feel rather sad. Why can't babies last just a little bit longer? I hope someone else finds this baby the perfect gift for their own little one. "Flirty" eyes move from side to side. This is the Gerber baby, famously modeled after the infant Brooke Shields, from 1979. She has weighted "flirty" eyes which move from side to side when you turn her head. Sometimes one sticks and she gets a cross-eyed look, just like a real newborn. She's a cute little thing. Actually, as baby dolls go she's not really "little". At 17 inches she's almost life size. 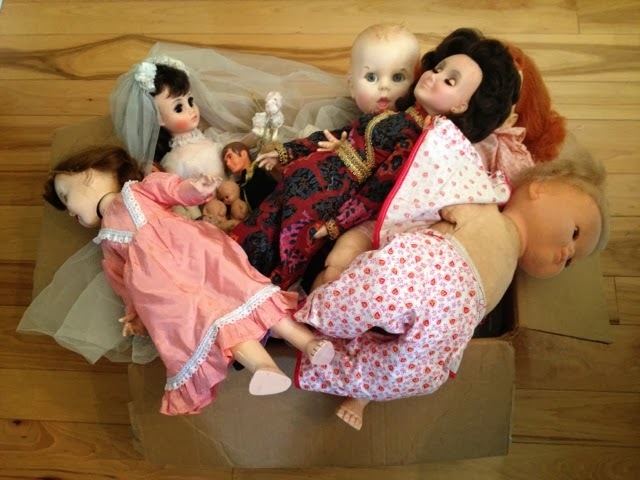 I got Baby in a big lot of dolls from the 1930s to the 1970s. She needed cleaning and her hair needed a little painting due to a rub in the paint. I got this baby in a big lot of dolls. To re-paint the hair I just sponged on a little acrylic artist's paint in thin layers, allowing each layer to dry before applying the new one. 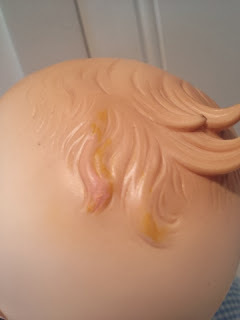 This is how I would recommend painting any acrylic baby doll's hair, such as Bitty Baby. In this case, the almost-flesh-colored, almost-blond translucent hair was a bit hard to match. I had to paint mine on darker to hide the rub. Mine is slightly more yellow than the original, but it isn't as noticeable as the camera makes it appear. I had to re-paint a little of the hair. There is a bubble at the tip of one lock, a factory flaw. After cleaning and painting I made a little lace skirt for Baby and gave her a matching headband. I gave her vintage faux leather shoes, just like the ones I remember my sisters wearing as infants, and a new plastic bottle. 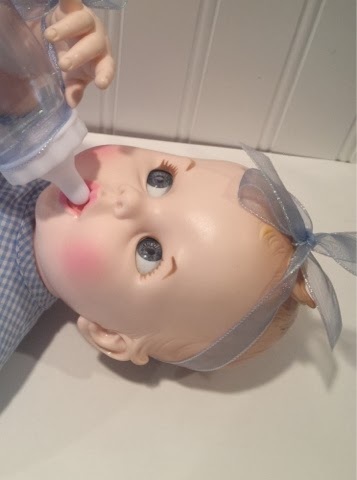 The bottle can really be filled with liquid and can dispense it, but I would not recommend that in this case since the baby is not a drink and wet doll. Baby can "drink" with her open mouth. I think Baby turned out well and looks adorable. You can find her in my store: http://stores.ebay.com/atelier-mandaline. I suppose another reason I like to work on a baby doll this time of year is this is the month for children, more than any other in our culture. 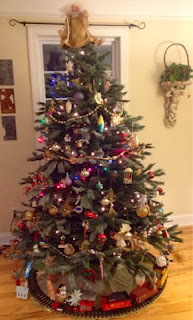 At least in our home, the focus of the season is on creating joyful traditions for the kids. When we first got married Jerry was very against Christmas carols and didn't enjoy decorating. He would always turn the football game up so loud you could barely hear the songs. I myself was never into over-the-top décor. I did always try to play the Christmas records my grandparents played while we decorated the tree. My mother would always serve cocoa and special chocolate or treats for tree decorating, so I do the same. Our first child was so enamored of the Fred Waring Orchestra Christmas album and Christmas villages and lights, however, we both made extra efforts in our Christmas preparations, and by now we have it down pat. 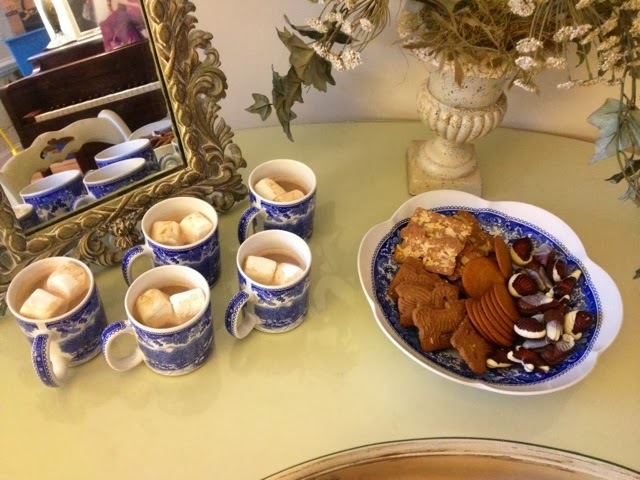 This year I served spekulatius (spiced almond cookies), pepparkakor, and Belgian truffles with homemade cocoa. We bought colored lights for the front porch and a little potted Leyland Cypress for the upper hall. This way we will have lighted trees in windows on both floors and we can plant the cypress in the yard after the holiday. We set up an electric train to circle under the tree. A gift from my sister years ago, it lights up and the smokestack puffs real smoke! I find it funny our son likes the same Christmas album preferred by my own father, who he never met. And at 14 he still turns the tree lights on the minute he wakes up in the morning, so I guess we've done a good job making the season magical! All this magic is a little hard on the figure, however. Besides the Christmas treats, we have a birthday this month. I slaved over a lavish lemon cake for our youngest son. Since I already made him a cookie cake while we were home for Thanksgiving, I thought a more sophisticated taste was in order. I squeezed the lemon juice by hand from fresh lemons, grated fresh zest with a microplane, whipped up my best frosting, and baked a dense, moist, lemony cake with organic coconut sugar for a caramelized citrusy flavor...and neither of our younger kids will eat it, so it's just sitting in the fridge, calling my name! I used a cake recipe from Pinterest, which you can find on my recipes board or here: http://www.lifeloveandsugar.com/2012/08/31/triple-lemon-cake/. 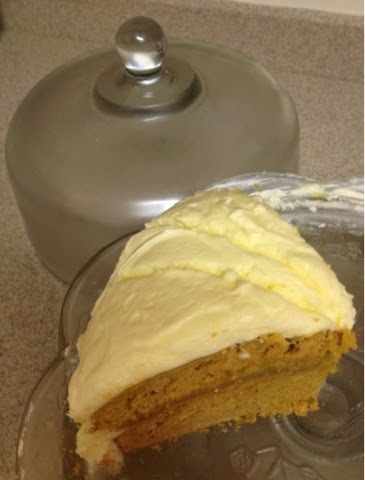 I used purchased lemon curd for the filling and used my heirloom lemon frosting recipe. The frosting recipe is here: http://mandalineartfulliving.blogspot.com/2013/11/the-companion-and-other-tales.html. To ice this cake I doubled the frosting recipe. To change the frosting flavor to lemon, reduce the cream to 1TBSP, add 1 TBSP lemon juice, omit vanilla, and add 1 TSP pure lemon extract per batch of frosting. I usually need to add more powdered sugar when I do the lemon flavor. Just add the recommended amount and increase by tablespoons until the frosting is as dense as you prefer. It is so wet and misty here our own Little Mountain, which usually looms over town, is invisible. 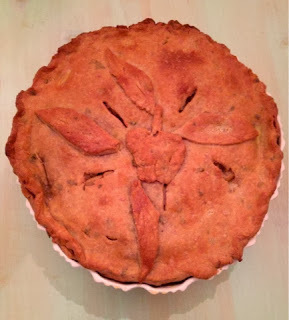 The cold, rainy weather has me craving savory food, so last night I looked up a recipe I used to fix often: Pork and Apple Pie. This delectable creation features spiced pork with sweet apple filling in a flaky cheddar and sage crust. I used to make it a lot when we had only one child, but now I rarely do because it takes forever. I bake this in a ceramic soufflé pan handmade by my aunt, but you can use a deep dish pie pan.You can find this on my recipes board or here: http://www.beingabear.com/2013/11/bear-essentials-apples-pork-and-apple.html. I used white whole wheat flour, so the crust took about twice as much water. Just knead the water in a tablespoon at a time until you can roll the dough without it sticking. I also used finely chopped fresh sage from our garden. After applying the egg wash I grated sea salt over the crust for extra glitter and crunch. The crust is divine. It tastes like the Southern classic, cheese straws; a great favorite of mine. Now we have leftover pork pie as well. It's not looking good for the low carb diet! I don't know if it matters; I'm not losing weight on that at all, even though Jerry has dropped several pounds. It's so unfair! Weight loss may have to wait until after the holiday. Now that the tree's all finished it's time to work on setting up the village. I'm really excited to have a mantle to decorate this year. I'll keep you posted on that! We've had another ultra-busy week. On Wednesday we traveled to Raleigh for Thanksgiving. While home, we attended a hockey game (with eight children, most of whom are under age 6! ), cooked and ate Thanksgiving dinner, then my dad and brothers-in-law took all the little boys to a Carolina football game while Jerry and I took our teen to the Porsche exhibit at the NC Museum of Art. The next night we held our littlest one's birthday party, put up my parent's Christmas tree and outdoor lights, and decorated the tree. I made a race car cookie cake, requested by the birthday boy, for the party, using miniature Porsches for the race cars. Then yesterday we had to rush home so our son could march in a Christmas Parade. The kid whose mother was supposed to drive the carpool got sick so we had to drive it instead. After the parade we attended the town tree lighting. Today, I have band fruit sale carpool to drive. Whew! This is not to say we haven't been hard at work on the house. 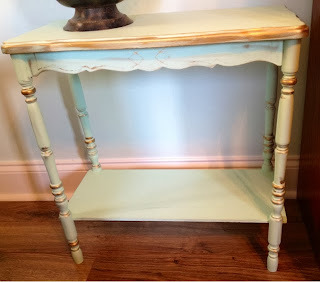 As you might have ascertained from reading this blog, I love painted furniture! 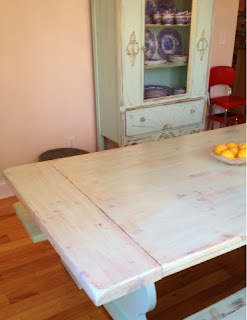 Jerry finished painting the kitchen table and I color-washed the top. Right before we left for home, Jerry finished the table top with polyurethane because it takes so much abuse. In fact, we've only eaten three meals at the table and the paint is already chipped off the base on the kids' side where they've banged the bench into it. So, now we will have to touch that up. 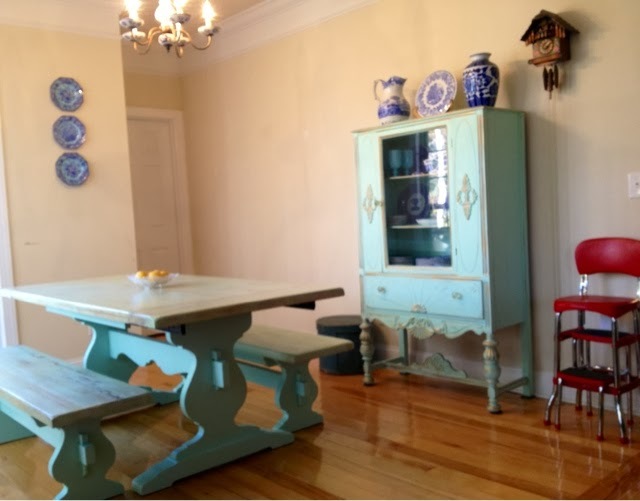 In the photo of the kitchen, the china cabinet was "antiqued" with chalk paint and Rub-N-Buff wax in Grecian Gold, the table and bench bases were painted with chalk paint, and the table and bench tops were color-washed. Many of my posts over the past few months chronicle these projects. 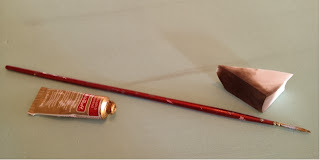 You can find the recipes and instructions for making the paint and using these techniques in my previous posts. The recipe for the chalk paint and instructions for "antiquing" furniture are here: http://mandalineartfulliving.blogspot.com/2013/09/how-to-antique-furniture-dining-room.html. The recipe and instructions for color-washing are here: http://mandalineartfulliving.blogspot.com/2013/10/every-new-beginning-comes-from-some.html. All we have left to finish the kitchen are the Windsor chairs. Our plan is to paint these with the same chalk paint in "Serendipity" by Olympic and then I want to paint some rosemaling (decorative Scandinavian painting similar to that on the cuckoo clock) on the backs. I may also put some metallic wax accents on the chairs if I don't feel like it's too much. I will show those as soon as I finish them, of course. Before we left for Thanksgiving, Jerry painted a little side table from my grandparents' barn. I wish we'd taken a before photo because it was a mess. 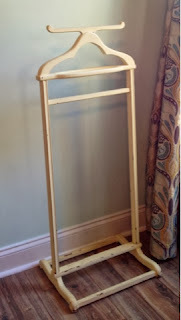 We found it in the barn, but I think before that it was used as a plant stand outside on the porch or deck. It's a sturdy table, but the original dark stained finish was completely trashed. The top and the shelf were covered with white water rings and the grain was dry and uneven. 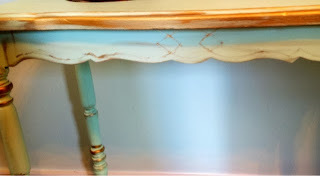 We used the same homemade chalk paint as the kitchen set, with Olympic's Serendipity in semi-gloss as a base. The bedroom walls are one shade lighter, Olympic's Oasis in satin finish. I love the look of monochromatic décor in bedrooms especially. It's very soothing. It can be rather boring, however, so good tip is to vary the saturation of the same shade by accenting with a slightly lighter or darker version. I painted the wax over the carving with a tiny brush. 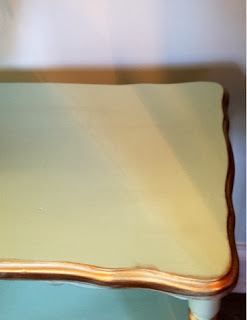 Today after we returned home from the little one's speech therapy I applied Rub-N-Buff metallic wax in Grecian Gold to the table to bring out all the carving. I can't believe my grandparents or whomever originally owned this table left it outside! I rubbed the wax on the turned legs with a makeup sponge and accented the thin curve and diamond carving with a tiny brush dipped in wax. The wall and table are one shade apart. The table is the perfect size for our new chair! The shelf will be great for holding the book or magazine I'm reading. I'm debating whether to place a lamp on the top. I found a gorgeous little capiz shell and chrome lamp at Homegoods that's just the right size and style, but I can't decide if I want to limit the movement of the table with a breakable lamp. 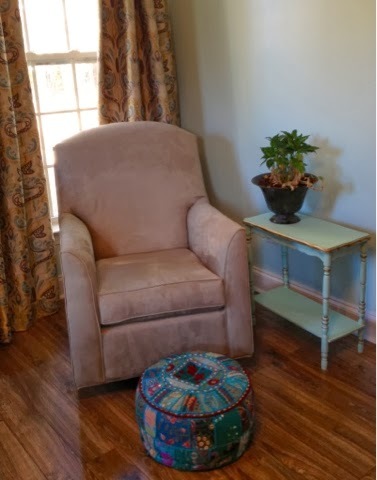 Right now I move the ottoman to the side and swivel the chair toward the window to save space when I'm not sitting in it, and a lamp would make the table stationary. I don't need the light since the window's there during the day, but it would be nice to sit in there at night and read as well. Another addition to the bedroom is my grandfather's 1940s "valet". Every night my grandmother would get my grandfather's clothes all ready for the next morning and place them out on this piece of furniture. There is even a little shelf for his watch and ring and the cuff links he preferred. Grandpa was a pretty snappy dresser for someone who owned an auto parts store! He and Grandma both loved clothes and fashion and they were famous around town for their style. 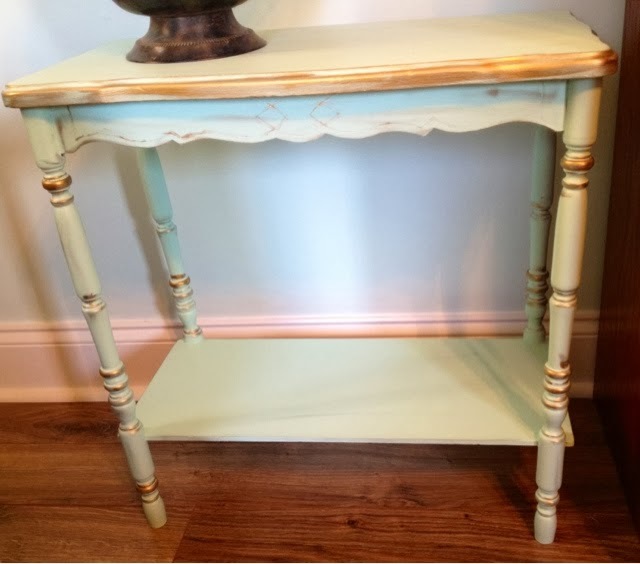 This piece was originally stained the dark mahogany so popular in the 1940s, but Grandma, who loved the airy Scandinavian and French Provincial styles, painted it pale, creamy yellow in the 1950s. This finish is naturally distressed, not painted for effect, after all these years! 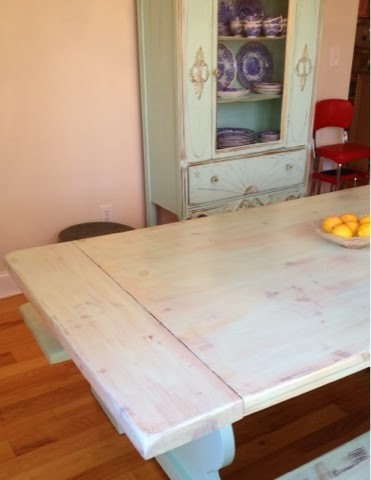 Jerry offered to paint it the same blue as the table and I did consider it, but in the end I decided to leave it. It looks the same as I remember and I like it that way. With addition of this little reading nook, the bedroom is almost finished. The bedroom is just about finished. It's very exciting, since we've never had a decorated bedroom in over 16 years of marriage. Jerry requested another mixed media painting to hang over his dresser and I'd like to do another small piece to hang above this little table. I may knit or quilt a throw or sew a pillow for the chair as well. This table was a fun little project, and a useful accent in the room!